Looking for a break close to Sydney? Stay in a cosy cabin in Lane Cove, 30 mins from the city, or try one of these popular getaways 1-3 hours away. Escape to Sydney’s majestic Royal National Park and enjoy a stay at the beautifully restored Hilltop Cottage. Dreaming of a country cottage? Head to Hartley near the Blue Mountains. Or get back to basics with a no-fuss holiday at the riverside Capertee Cottage in Capertee National Park, near Mudgee. Wake up to views of the Sydney Harbour skyline at Steele Point Cottage in Nielsen Park, Vaucluse. This fully self-contained heritage accommodation on the harbour foreshore offers a private and secluded getaway for 2 people. Capertee Cottage, offers walking, birdwatching and paddling in a scenic riverside setting, not far from Mudgee within Capertee National Park. Stay at deluxe St Bernard’s Presbytery cottage for a romantic getaway. Located only 15 minutes from Mount Victoria, it’s the perfect spot to immerse yourself in Hartley Historic Site’s colonial past. Enjoy old world charm at iconic Jenolan Caves House, in the heart of Jenolan Karst Conservation Reserve. Stay at this historic grand hotel as you explore the spectacular caves and walks, near Oberon. Visiting Jenolan Caves? Stay at Jenolan Caves cottages, family friendly accommodation located just 8km from Australia's most spectacular caves in Jenolan Karst Conservation Reserve. Base yourself at Jenolan Mountain Lodge, offering comfortable motel-style accommodation, when you explore the natural wonders of Jenolan Caves, near Oberon. Hilltop Cottage offers heritage accommodation in Sydney's majestic Royal National Park. It's an ideal base to explore the surrounding walking tracks, beaches, and wildlife spotting opportunities in the park. Stay at Reids Flat Cottage at Audley, just 1 hour south of Sydney. This heritage accommodation is the perfect base to explore Royal National Park, with kayaking and cycling opportunities right at your door. 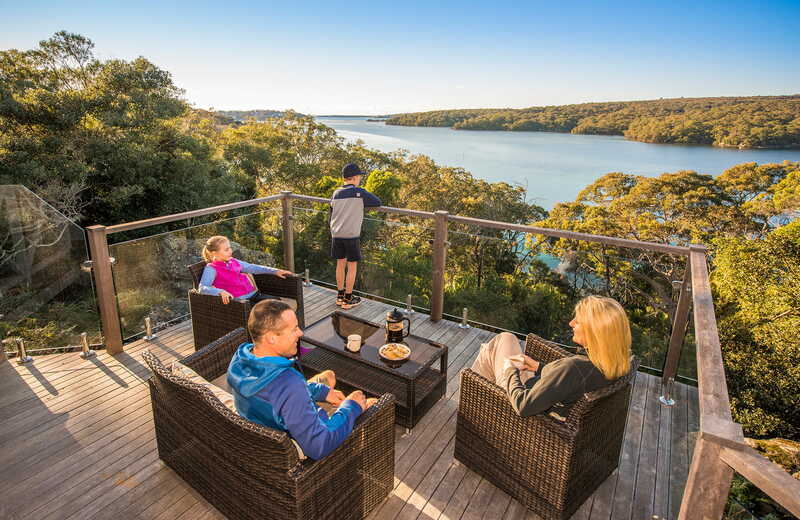 For a perfect weekend getaway, Weemalah Cottage offers swimming, canoeing, fishing, and great scenic walks in a secluded riverside setting in Royal National Park, near Sydney. Big Yango House is a perfect base to explore the rich Aboriginal and natural heritage of Yengo National Park, as well as mountain biking, horse riding and birdwatching. Lane Cove Holiday Park offers comfortable studio or family cabins for people wishing to explore nearby Lane Cove National Park, and affordable accommodation close to Sydney. If you're planning a getaway, why not set up camp and enjoy a nature escape at a national park campground in and around Sydney.